The Topkapi design was inspired by the dream of creating a product with a magical atmosphere. The name Topkapi says it all. This Effegibi range immediately evokes all that exotic magic, created with the priceless contribution of Rodolfo Dordoni, working in partnership with Michele Angelini, to produce Topkapi, the quintessential Hammam. Specially selected materials, blending precious marble, glass, steel and teak, create the design harmony that makes Topkapi truly unique. 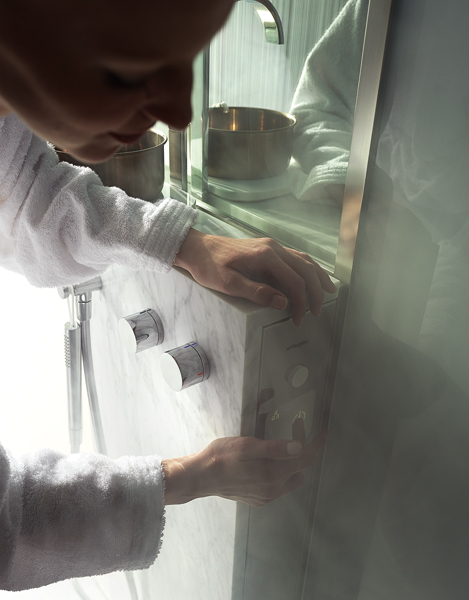 Steam is the main player, the essence of the Hammam tradition. Another feature of the design is water that flows through a generous-sized shower head with colour therapy, through a flexible hose, or collected in a bowl from the spring that evokes the historic tradition of the Turkish bath. An ultra-slim panel of LEDs infuse the cubicle with light, accompanied by music, to make each session in a Topkapi a unique experience that delights all the senses.